Again, I am pressed for time as a presentation looms, T-minus one hour to be exact, so I am sort of mailing it in today. The card above is from the ever glorious 1973 Topps set, which is world, no, make that galactically famous for it's "photography." While this card does not feature the rear-end of an umpire, it is still epic. This shot is of a helmet-less Bobby Bonds scampering back to first base on a pick-off attempt. Blocking the bag is none other than Pops, also known as Willie Stargell. 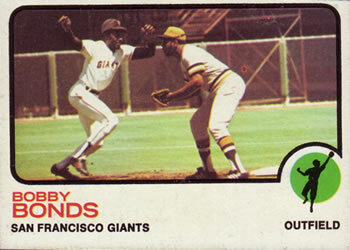 Although Bobby Bonds is not really a common, it is cool to see a Hall of Famer making a cameo appearance on his card. All you Willie Stargell fans, be sure to grab a 1973 Topps Bobby Bonds to round out your Pops Player Collection! I'd missed this card, or at least I don't remember this card. '73 action cards rule the universe, no doubt. I have a number of them, but not this one. Yet.